Last year on Opening Day, Clay Buchholz pitched a shutout and Dustin Pedroia homered twice in the Red Sox’ 8-0 win over the Phillies. I’m telling you this to prevent you from getting too excited about winning the first game out of 162. I will say that a big difference this time around is the fact that our Opening Day starter is actually a legitimate ace. Last year we were pleasantly surprised when Buchholz pitched a gem to start the season and it’s safe to say that no one was shocked when he got absolutely lit up in his next start. What David Price did Tuesday is what we expect him to do basically every time he takes the mound. 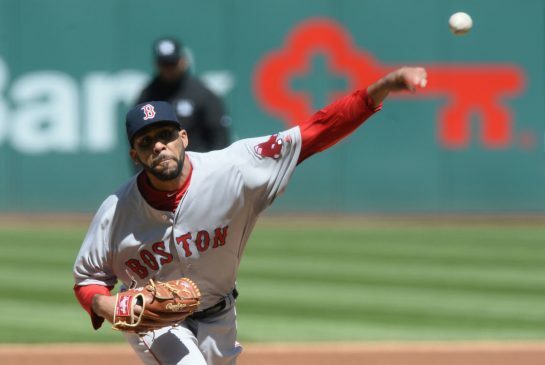 In his Sox’ debut, Price gave up two earned runs on five hits and struck out 10 batters. Not the best performance we’ll see from him, but good enough to get the job done. Mookie Betts got things started for the Sox offensively, hitting a home run on Opening Day for the second consecutive year. His two-run dinger in the 3rd inning gave Boston a 2-0 lead. Price’s only bad inning came in the 4th when he allowed Cleveland to tie it up with an RBI single by Yan Gomes and a sacrifice fly from Marlon Byrd. Brock Holt looks like he’s going to continue produce the way he has the last couple years. He picked up a couple hits and gave the Red Sox the lead back with an RBI single in the sixth. Later that inning, Travis Shaw scored on a wild pitch by Corey Kluber to extend the lead to 4-2. The last two insurance runs came in the ninth when David Ortiz, in his final season opener, hit his fifth career Opening Day home run. His two-run blast was the icing on the cake for what was as good a game as Sox fan could have hoped for. Although it wasn’t a save situation, Craig Kimbrel also made his Sox’ debut in the ninth when he struck out two and walked one in a scoreless inning to end the game. It’s good to get a win to start the year, but now comes the moment of truth where we find out whether or not starters 2-5 are going to be able to make the Sox a winning ball club. We basically need to win every time Price pitches because there are no guarantees with the rest of the staff. Next Why Are We Still Relying On Clay Buchholz?